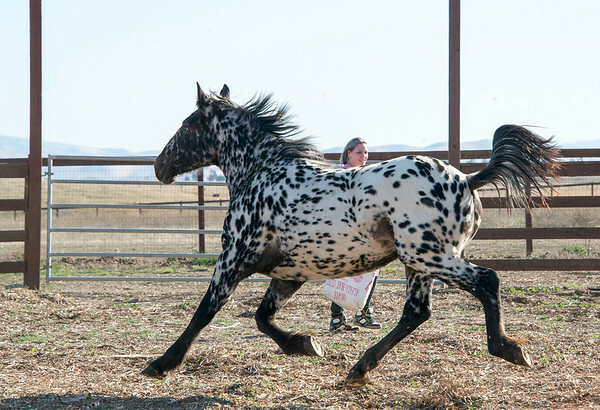 Stonewall Mystique is one of the finest living examples of a high percentage Percheron leopard draft horse. She has a deep and powerful family, including most of the important influences in the Stonewall Stud Book. This young mare is the daughter of the Knabstrupper stallion Magique de Bec by the imported Apollon* line stallion Atlantis*. Mystique's dam is the purebred Percheron mare Stonewall Debutante. Stonewall Mystique has already traveled with the Caravan from Texas to Florida, gaining a wealth of experience to prepare her for a useful life as a pleasure, trail and competition riding and driving horse. She is very well started in harness and under saddle.